Sitting under this arch-hallway… two (three) heads are better than one when doing heavy intellectual lifting… and there might be plenty to be sorted out now. Today’s numerology is “seven”. Strategizing with someone else or your >team<… can be inspiring & of course it’s also fun. 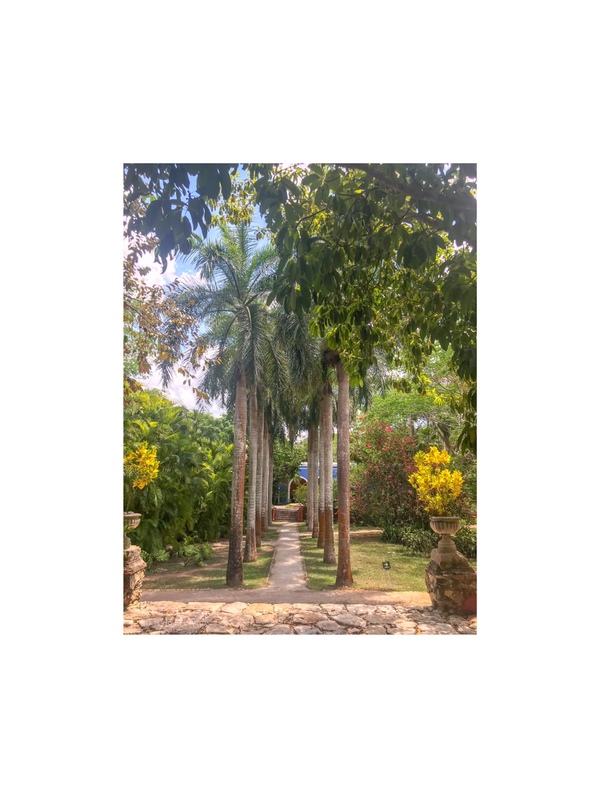 My client, the architect and me… by the flair and sound of the birds singing, we are enjoying a delicious yucatecan breakfast and having some hot brainstorming . By the way a trial-and-error approach can be an exhilarating way of reaching your goals . Unleash your creativity and watch your star rise! Nevertheless, some might want to do things in your own way, but your friend, relative, or partner has ideas of his/her own? Here my tip under today’s numerology : Cooperation is almost certainly the preferable option now. By the way, eventually, you might happily admit that some of your loved one’s proposals work out just as nicely as anything you could suggest. Appeasing others today ends up pleasing you. Wishing you all a very joyful & harmonious Saturday. A fresh week with exciting energies …. hello and good morning on this Monday morning! The rose-colored glasses ( once Venus + Neptune are in charge), sensitivity and compassion. Well, this is on of this super lovely weeks of the year… of you celebrate your Birthday in the following days … you will really enjoy the party, friends , love …. the whole package. B u t, please be warned that the Venus-Neptune conjunction will heighten the fantasy element for a couple days. So, watch out carefully, not to get sucked into some charmer’s undertow. This week also the truth-telling Jupiter starts his annual retrograde until August 11 , 2019 ( inSagittarius) . Wow, this might bring some surprises… outspoken is one thing …out of the plate is quite another. Consider yourself on notice! I am just saying, embellishing stories (even in “the most harmless” ways) could seriously damage your credibility over the coming four month… more details coming with the next breakfast! It’s Friday! A very special day with the Aries New Moon under today’s numerology #three. With all this happening in the first zodiac sign it promises to be a day filled with renewed spontaneity and enthusiasm, with a lot of sizzle and zazzle, lighting up and magnifying every emotion. For a moment… Reminders will pop up everywhere around you, whispering or shouting about how much there is yet to >learn< . The good news is, that you are not alone in this inspiring journey. You will be in contact with interesting teachers and students along the way. Well, let’s say it could be rocky start, while the Moon squares taskmaster Saturn and ruthless Pluto…. b u t breathe, … the general overview is very positive… if you go with the flow. So, be mindful … as whatever and whoever is invited into your world today is likely to stick around for a while. Step into the adventure zone, have a look around, and make yourself known. Finally Originality is the secret of your success! Happy New Moon! Happy Friday! Keep your thinking cap powered up and close at hand. Take ownership of what you can control and let go of the rest. There is a subtle tug from your intuition that may be holding you back today and inviting you under the Numerology #two✨ …. to >not< throw yourself wholeheartedly into whatever you do…. Temporarily close the curtains, turn off your phone, and hang a do-not-disturb sign on your door. You need time to balance things . For some of us this could be an easy and quick task … especially if you can solve it by yourself . For other this might require a bigger adjustment. Follow your curiosity wherever it leads. Finally it’s always better to find out than to suppose. Wishing you all a very productive and successful Thursday…. tomorrow is New Moon Friday… I’ll be posting details. It a fresh month with exciting energies and opportunities. We are starting a New Moon week,; the Sun and the Moon dancing in the fire sign, Aries. Every bit of feedback received is valuable as you work to turn a dream into a reality. My next tip for you is to pack an extra dose of flexibility. People can be unpredictable creatures, there’s no doubt about it. It’s unnerving when someone says one thing, then does another. If you find yourself on the receiving end of some of that kind of chaos, going with the flow could be the best available option, at least for now. Consider it as “the” opportunity to give your resourcefulness and resilience a healthy workout. Wishing you all a very successful April. Happy Monday ! Thanks for reading me.